Not a great shot of the hat but this photo should be helpful if you ever need to pick my profile out of a lineup, no? I just love a nice set of crown decreases, don’t you? More info and better pictures to come later when I officially release the pattern. To reiterate, it will be sold as part of a kit at the Burgis Brook Alpacas booth at Rhinebeck, and will be available digitally after the festival. Now for some real WIPs! That is the start of the third sample for my Beribboned Hat design. Once I finish it and photograph it I’ll be able to release the pattern, yay! I love releasing new patterns. 🙂 I’m really loving this new yarn, too. It feels a bit like The Sanguine Gryphon’s old yarn, QED, except softer and silkier… so, even better! See where the stitches on the needle switch from green to white? Well, the white ones represent how many more “short” (ha!) rows I need to knit before I can begin the edging. There are 48 stithches, so 48 more rows. Sigh. I cannot wait to wear this shawl. Every time I wear an outfit that would match it perfectly the little fashionista in me feels sad. I’m setting myself a goal to finish it by the end of September, which is the VG Open House in Maryland. I’d love to be able to finish and wear it there. Don’t forget to check out what everyone else has been up to! Hope you have a lovely Wednesday. 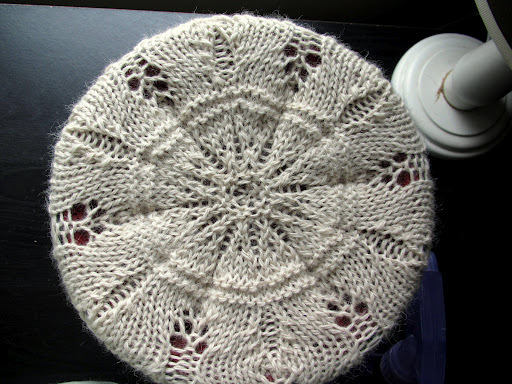 This entry was posted in FO, hats, MyDesigns, shawls, socks, WIPWed by shoelaceswitcher. Bookmark the permalink. I still love the color affection, but don't blame you for wanting to get it done. And the hat for the alpaca is just so pretty! I can't wait to see better shots of it! Love that new hat design! And have to say I just started a Color Affection as well- I just couldn't resist any longer- something took me over and I found myself at my LYS clutching a skein of sock yarn from my stash looking-searching for two others to go with it…I'll race you to the end of September. Thank you! Can't wait to see your shawl! 🙂 It actually progresses at a nice pace until you hit that third section. I love them all … but especially the color affectation! What is VG Open House? I'm in Baltimore … is it a yarn store opening? You know how much I'm in love with your color affection, I simply cannot wait until you finish it and show it off! 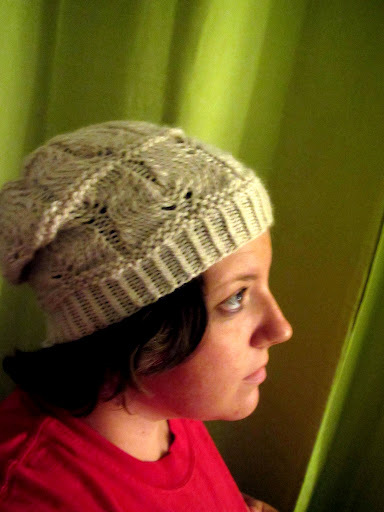 Although I suppose seeing a wonderful new finished hat design can hold me over. Also, you have such great taste in yarn! a lot of stuff going on! I particularly like the colour of beribboned, and I'm a fan of colour affection. The Verdant Gryphon is opening their studio for their fans to come and swarm the place. 🙂 http://verdantgryphon.com/catalog/index.php You should definitely come! Thank you! It's unfortunately expensive taste, as well… haha. 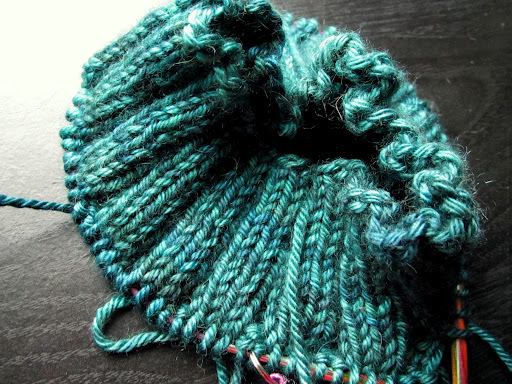 The Huacaya hat is gorgeous, and the yarn looks really lovely and soft. I love the slight halo it has! And colour affliction is looking great! Your hat looks great! What cast on did you use to match the rib so well? The blue (teal?) is a super pretty yarn too. You are a busy lady! So many hats–I love them all, but really, really love your “holiday” socks! The more I see that color affection shawl the more drawn to it I am –you will look lovely wrapped up in yours. Wow! You've been up to all kinds of good stuff lately! 🙂 LOVE the alpaca hat (you're right, the crown looks awesome! 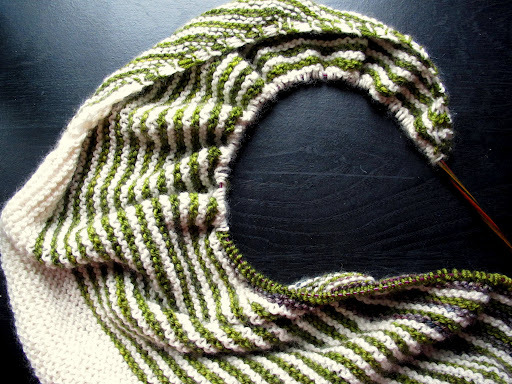 ), and your color affection shawl is looking great! 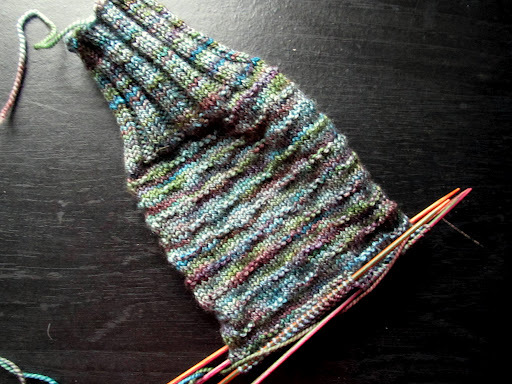 Of course, the socks are lovely, too, and I can't wait to see Beribboned #3 finished up. That Mondegreen is just ridiculously gorgeous! Thank you! Yes, the alpaca has a great halo. Thanks! I like the Twisted German Cast-On for all stretchy edges. I know, Mondegreen is going to bankrupt me… coming out September 17th!